A quip here. A comment there. The things you pick up over a lifetime in and around the NHL that provides a unique perspective. That's what you'll get with Gord Stellick's, Stellicktricity. 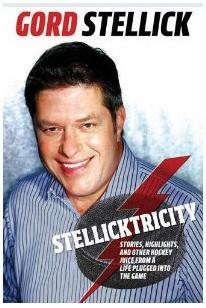 From the youngest general manager in NHL history to veteran on-air hockey analyst—Gord Stellick has seen it all, and now tells it all in Stellicktricity: Stories, Highlights, and Other Hockey Juice from a Life Plugged into the Game . Few have been given the opportunity to be on both sides of the hockey rink—managing the Leafs and the Rangers and then regaling his legion of TV and radio fans with the colourful insider knowledge he's amassed—about blockbuster trades, NHL stars, and the talent that got away. But Gord Stellick has. In an almost forty-year career, he's one of the best known hockey personalities around. And Stellicktricity captures the man, his career as the ultimate hockey insider, and insights and anecdotes on the game he loves so much. Not only is the book crammed with details on hockey greats like Gretzky, Orr, Sakic, and Crosby, his NHL bosses (like Harold Ballard and Punch Imlach), but it also contains an inimitable look at Stellick's colleagues in the media. Destined to become a favourite of hockey fans everywhere, Stellicktricity not only covers every corner of the game of hockey but offers the author's unique view of other sports across North America. The Toronto Maple Leafs ownership was too cash-strapped to give management the approval to sign unrestricted free agent Wayne Gretzky in 1996. The Boston Bruins badly coveted defenseman Keith Brown in the 1979 NHL Draft. When Chicago took Brown 7th, the Bruins were had to settle for another defenseman - Ray Bourque. Right before the Leafs drafted Luke Richardson, a heated argument broke out at the Leafs draft table as one scout wanted to go off the board and draft Joe Sakic. I did not know these tidbits either. And I learned them just by reading the first few pages of Gord Stellick's Stellicktricity. By turns serious and funny, every page of Stellicktricity crackles with the wit and wisdom of a born raconteur—and the hard-headed, real world insights of a man who's lived and breathed the game of hockey for the better part of his life. Good book but wondering how Wayne Gretzky was mentioned as the Coach of the 2002 Olympic team??? C'mon Gord, how could the editors not correct that to the proper term. Is Brian Burke the coach of the Leafs?